39640 Four purple-toned panes of patterned glass cast a fascinating halo of rainbow light! A candle’s glow becomes magical as it shines from within. 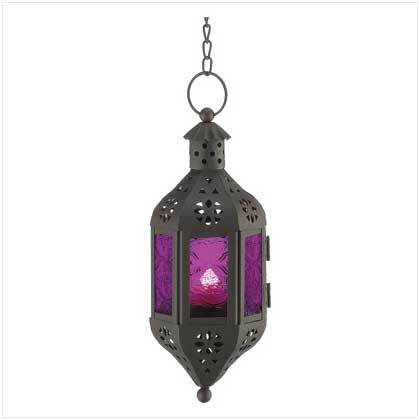 Handsomely styled cutout metalwork recalls the beautiful hand-wrought lamps of a Moroccan marketplace. Metal and glass. Candle not included. 4" x 4" x 10" high.